I'm working in an unofficial clone of the Moodle Mobile app for iPhone that works on Android and Blackberry devices (WebWorks, OS 6.0 and higher). It should work also on iPhone and iPad. Phonegap enables you to build your app once with web-standards and deploy to multiple platforms. Please note that this app is not a replacement or improvement of the official app for iPhone (and Android when available). It has beend designed to be a good starting point for creating your own custom app because is easily customizable and extendable using web technologies by anyone. Awesome, Juan! This is definitely on the right track! Thank you! It's great to see a HTML5 app in action. I tried the "participants" section in chrome and in iOS/phonegap. It works very nicely (except I could not store as I didn't setup the browser and only used phonegap 1.0.0 in iOS). * It seems to me you are using the phonegap function localStorage. What do you think about the offline storage capability (was it easy to use, what are the limitation)? * As you have been using Moodle web services, can you give a feedback about the web service in Moodle 2.2. What was good, what we should be improving and focusing on? * the android link doesn't seem to work ("The page doesn't exist") https://build.phonegap.com/apps/49110/download/android. Thanks again for sharing this template app. Hope you can keep it updated I'm going to add the github link into the web service client documentation. I'll test it more with iOS (need to install the 1.20 and try it on a device). I also can test it with my Nexus S. Can you send me the apk? localStorage is indeed a HTML5 function. Phonegap wraps it if is not availabe in your browser. Since iphone, android and BB uses a html5 webkit based browser it should be natively available in these platforms. I choosed jquery mobile because it is very easy to use the markup language. Another point for chosing jquery mobile was because the new MyMobile core theme for Moodle 2.2 uses it. As far as I know there is no manifest in jquerymobile. Thanks for the reports + fixes too I'll tackle these issues after 2.2 release. I tried https://build.phonegap.com/apps/49110/download/android on my Nexus S (allowing any apps to be installed) and it displays "The page you were looking for doesn't exist.". Ah yes with the direct link to amazon it works. It's weird but good to know. I tried the three upload functionalities, they work. Only I had some issues when taking a picture. I had to press multiple time cancel button or take a picture multiple time to quit the "camera app". It's probably a phonegap issue. I did try uploading a picture and an audio record. The android app gave me a success message but the two files could not be found in the user's private files area, nor in table mdl_files. I made changes for maximum upload file size but I didn't get it working. Upload always fails to me. What are the things I would have to make sure other than upload file size limit? I figured that upload feature only works through http not https. Anyone has an idea why this is the case? Be interested to know your thoughts on getting this stuff into regular moodle, rather than an app style interface? e.g. 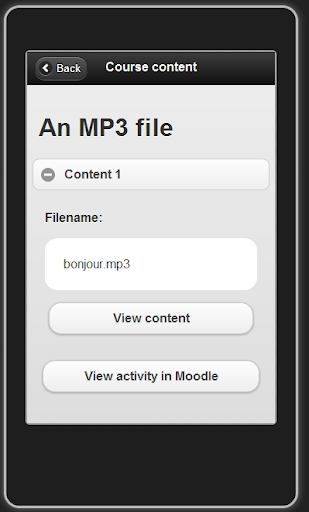 making the things that currently don't just work on mobile (file upload etc) work as standard in moodle? 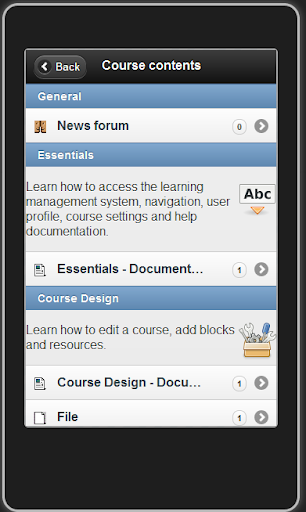 I think that the MyMobile theme is achieving good results and it's a good starting point for improving the Mobile support in regular Moodle. agree - its not an easy question, but it is one i fear we all have to face. Our moodle saw an astronomical rise in the number of 'mobile' (including tablet) hits this year. It looks set to overtake 'desktop' users by 2013 if it continues at the same rate. I fear that by focusing on specific mobile themes, we may be engaging in an elongated distraction. This isn't to de-value the work of yourself or mymobile - both of which i think are great projects. 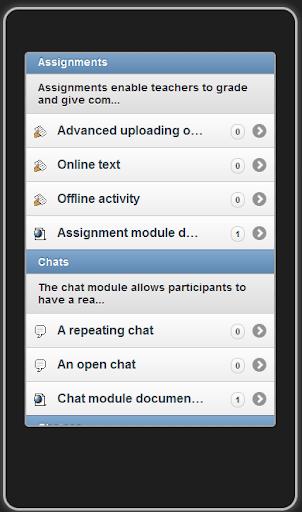 If more of your users are viewing your moodle on a mobile theme, then what is your users primary experience of moodle? Where should your priorities be? If we think about our own users primary experience of moodle it will probably through mobile, within the next few years. Faced with this it would lead any of my managers to conclude that we focus on the majority of our users first. We use a mobile theme as our primary theme. We would then have to extend that for the (minority) desktop users. Anyway, its a situation we are not quite in yet, but judging by those ever rising stats its getting nearer, and i wonder if any other moodle users are feeling similar. if it is possible please give me feedback as soon as possible. I created an apk and discovered that "Participants" and "Contents" showed exactly the same thing, My Courses. Q: what have i missed? Sorry I found "Participants" and "Contents" showed My Courses first and then "Users" and "Course contents" respectively... So it works tho' a bit confusing. Is there anyway to have the app automatically download course files or place it on a schedule? This would be really useful. We have a number of students without Internet access at home and having their assignments downloaded a week in advance would prevent them from being behind if they miss a day of school. I know it requires a lot of storage but perhaps it could specify activities vs. resources and/or between media and documents. This would make Moodle the ultimate 1:1 tool for K-12 schools. I view that is will make d app more functional even in open distance lqearrning. Hey, I tried installing this app on my Android Tablet using android 4.0.3. The application got installed but refuses to login. i was wondering if there is any progress on this... how can i use this app to access my course contents offline.. is it possible?? I have both devices, but it is really different to use the app in iPhone. There are some bugs in Android when logging in to secure network, in iPhone there is none and I can also access secured site even I am working at. I tried installing this app on my android tablet using Android 2.2..
my moodle version is 2.2.1, i made all the necessary settings as mentioned in readme.txt.. i have downloaded the app from Moodle Plugin directory..
Is it possible to create Apple and Android customized package and upload to store? Hi Juan, this app is great.. im looking forward for the new moodle mobile update as im planning to cuztomize this app for my final year project. btw.. I dont see any logout option for this app. All I can do is 'add a new site'(which is the same site) to login as a different user. A log out button would be convenient. I have problem in accessing Moodle Mobile on my iPhone safari browser. Is it that it only works for Desktop Chrome with the below settings enabled? "You must run Google Chrome in Unsafe mode adding this params: --allow-file-access-from-files --disable-web-security"
What settings do I need to do in order to make it work on all html5 supporting browser?